What happened to the Mulberry Tree? Rolleston has a new Neighbourhood Policing Team! A local resident remembers an old, listed, mulberry tree stood in front of “The Bakehouse” (next to the last Post Office) on Station Road, until recent years. The tree is reported to have had a plaque commemorating the gift of the tree to Sir Oswald Mosley from an Arabian state. Can anyone comment on the disappearance of the tree and its plaque or the actual wording on the plaque? Any information to the Rollestonian editor (tel. 813320) please. The North Staffordshire Association Six-bell Striking Contest, was held this year on 3rd October. The competition is open to all Sunday service ringing bands within the Archdeaconry of Stoke-on-Trent, though in recent years very few of the 73 eligible churches have felt able to enter. The ringers of Rolleston on Dove have almost never been strong enough to put in a team, although several have helped to make up the numbers in other locally entering bands, including Burton St Modwen’s and Stretton St Mary’s. Indeed, a couple of our ringers were a part of the winning St Modwen team of 2006. Over the past year or so, however, Rolleston’s 6.30pm Sunday service has seen a regular band of six loyal ringers turning out, week by week, to herald the start of Evensong, and it was decided that, this year, Rolleston should enter a team. The contest was held in the centre of the county, on a newly fitted ring of 6 bells in the church of St Peter, Caverswall. Eight teams were scheduled to compete, including the mighty Stafford St Mary band, who have been the victors on numerous occasions. Also entering were the folk from Caverswall, and a team from All Saints, Sandon, both of which bands were made up mostly of ringers who took up the hobby only two years ago. We all gathered together as the draw for competing order was made. We were picked seventh out of the hat, which did not seem ideal as the nerves began to kick in, but settled down to listen as the competition began. The rules stipulate certain constraints, but are not so proscriptive that all bands must ring the exact same pattern or method. The point of the exercise is that each bell strikes cleanly and accurately within its own position, without either clashing with or leaving too big a gap between the other bells. The tune played can be as straightforward or as fancy as the band wish, it’s the way they ring it that counts. Each team has 15 minutes in the tower, allowing about ten minutes for practising, a minute to breathe deeply, and then four minutes of ringing the competition piece. While all this is happening, a keen-eared and knowledgeable judge, notepad and pencil in hand, is ensconced in the churchyard outside, assessing the quality of the sound and noting where faults occur. We had decided to ring a method called Grandsire Doubles,which we often ring for the evening service. Having listened to the six bands before us, and heard some pretty impressive efforts, we nervously climbed the tower, checked the ropes for length, and tried out these newly hung bells which we, like most of the other teams, had never rung before. We rang our Grandsire through a couple of times, had a final practice at starting cleanly, then launched into our party piece. Relieved that it was over, we descended the stairs to listen to the final entry and await the outcome. The judge, an accomplished ringer, was Paul Lewis of Shropshire, and all eyes and ears were focused upon him as he summed up the various attempts, and gave his verdict on how many faults had been incurred by each team. The suspense was great, as several of the teams were separated by only a single fault. However, when all the results had been declared, the fact emerged that, by half a point, Rolleston had won, and could claim the magnificent 6-bell shield, for the first time ever. The competition had been close and fierce, but in 2009 it is Rolleston on Dove whose name will grace the shield. The Rolleston ringers are naturally over the moon at having attained this honour, and it is a co-incidental but fitting point to note that this was achieved in the week that saw Ian and family, and the whole congregation, celebrate the 10th anniversary of Ian’s installation as Rector of Rolleston. One of Ian’s objectives on his arrival in1999 was to once more set the bells of the parish church sounding in the service of the church, and he has certainly done this. That the bells are now rung every Thursday and Sunday, and enjoyed by ringers, congregation and the villagers generally, may be the icing on the top of a thriving campanological cake. So thanks very much to Ian for that. And maybe the 6-bell shield, sitting resplendently in our ringing room for the next twelve months, is the cherry on the top of the cake. Please do come in and see it, and ask about what we are ringing, and even have a go, sometime soon. September brought a new Police partnership to Rolleston, with the start of PC Roy Musgrove and PCSO Lesley Hardware. PC Musgrove and PCSO Hardware have been appointed the Neighbourhood Officers for Tutbury, Hanbury, Anslow, Rolleston, parts of Outwoods and Needwoods. PC Roy Musgrove joined Staffordshire Police in January 1991, when he was stationed in Tamworth. He transferred to Burton in 1994, where he worked on Immediate Response Officer, until joining the Traffic Group 1998.Following this he spent time in the IMU before being selected in 2003 for a government funded initiative called “Neighbourhood Management “working within the Eton Ward. PCSO Lesley Hardware joined Staffordshire Police in February 2009, after she had been working for East Staffordshire Borough Council for nearly 3 years as a Community Warden. Previous to that Lesley had worked for Staffordshire Youth Service. A problem which greeted the new team was an increase in break-ins of work vehicles and van’s parked on residents drive ways within the Rolleston area. Also targeted were isolated outbuildings and sheds. Both types of burglaries have had power tools & machinery taken. Wartime evacuee, Tim Wood, who stayed at 224 Station Road, has been in Rolleston filming for a BBC programme 'The Week we went to War'. The series, presented by world-renowned singer Katherine Jenkins, celebrates the everyday heroes of the Home Front. He appeared in the first one, on Monday 7 September, and can be seen visiting his former home, and also inside Rolleston Club and St Mary's Church, and tells of the emotional trauma of his wartime evacuation in Rolleston. He writes “A whole day's filming and I may be playing my starring role for about 8 minutes!! TV Fame is a hard road to travel!” He obviously fell in love with the people and place and did not want to leave. 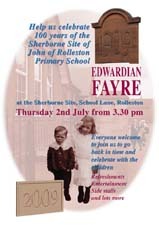 On Thursday 2 July the children and staff at John of Rolleston Primary School invited any interested villagers to their Edwardian Fayre. There was dancing and singing from the children, stalls to try your hand at, a Guisers play from members of RODSEC, displays of work completed by pupils and the opportunity to see how the school might have changed since you last visited. Admission was free but with any money spent on the stalls going to charities chosen by the Year 6 children. The event, held on Saturday 6 June, was well attended despite the bad weather, and raised £5,000 for the school. 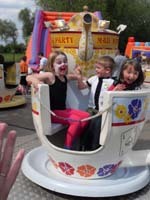 Attractions included stalls, a barbecue, a Nintendo Wii fit games console and dance mats, refreshments and a tombola. 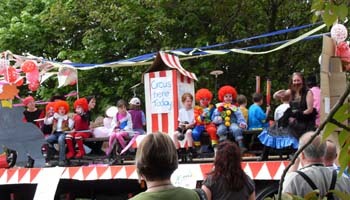 The 32nd Rolleston Carnival was a fantastic success. Together with brilliant weather and a crowd of over 1400 the day was superb. All seemed to enjoy the various stalls, from the plant and cake stalls, to the quadbikes and the huge inflatable slides. The hook a duck stall seemed to be very popular this year and accompanied by candyfloss, a burger and ice cream who could ask for more. 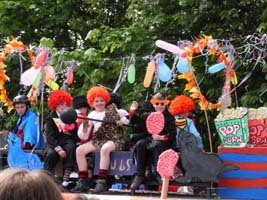 The Floats this year were judged by Marylin Marrison and Jackie Foot, two members of the RSG Events team at Rolleston. Thank you to everyone for their support, either by coming along on the day or sponsoring the programme. Mr Tom Martin has been voted the worthy nominee for the "Rollestonian of the Year Award 2008". 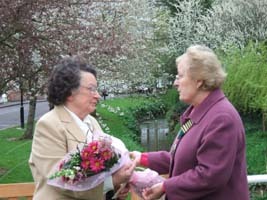 This new award has been created by the Parish Council to recognise the efforts of a villager who goes above and beyond what is considered normal to help the community. 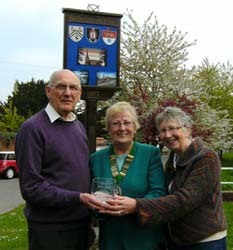 Mr Martin was presented with his award on Monday 20th April 2009 at the Annual Parish Meeting. 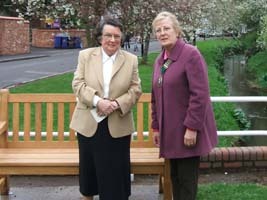 The Parish Council gave a presentation to Mrs Ann Bradley on Thursday 9th April of a memorial bench in Brookside which has been dedicated to the memory of Ken Bradley. 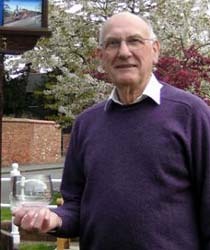 Ken Bradley was a Parish Councillor for 15 years and died in 2006 whilst still active in his duties. 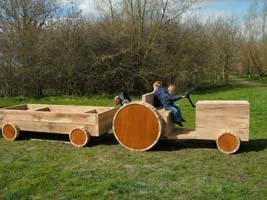 The Parish Council are delighted to advise that a timber tractor and trailer has been constructed and installed adjacent to the picnic area in Craythorne Woods. This piece of play equipment enhances the picnic area and has already proved to be a very popular piece of play equipment. The materials for the tractor and trailer were financed through SCC Local Member Initiative Scheme and was constructed free of charge by Mr Barry Edwards. 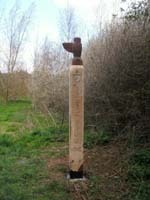 The splendid signpost with the owl perched on top, with its wing pointing to the picnic spot, was the result of many hours of work by Mr John Underhill. Rolleston resident Frank Bather, who represents Stretton on East Staffordshire Borough Council and who is a member of the area’s sports council, said: "The college has been playing games. We are in serious need of sports facilities and this is a gem of a site, right in the centre of the community. We want more clarity and openness from the college, and I think it is being very selfish about this. They have gained so many advantages from this particular site and there is a great deal of support for more sports facilities. 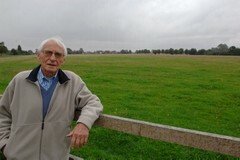 College bosses have said in the past that opening the land up for sport would result in ’serious legal complications’. The need for extra sporting facilities was highlighted last year when Stretton Eagles Football Club and Rolleston Cricket Club applied for permission to create new pitches on land in Dovecliff Road. However, the scheme was rejected after planners said that accepting the proposals could create a dangerous precedent as the site — including an associated housing development — was outside the village development boundary. Another article in the same paper talks about how vast swathes of countryside around Burton could be bulldozed to make way for housing. East Staffordshire Borough Council’s Housing Strategy — a ’five-year plan’ outlining the authority’s housing needs — lists more than 100 predominantly greenfield sites across the borough which could be allocated for new homes, including the sports field and Craythorne Golf Club. A final list is set to be approved by the full council in the summer. If you wish to make comments on the Draft Strategic Housing Land Availability Assessment document please do so by using the comments sheet on the East Staffordshire Borough Council Planning Policy webpage or write to Philip Somerfield, ESBC Planning Policy Manager, e-mail: philip.somerfield@eaststaffsbc.gov.uk. All comments should be submitted by Friday 17th April. (Burton Mail article by Keith Bull - 1st April 2009). St Mary's church was broken into on the night of Friday 20th March. The thieves broke through the front door on Church Road causing damage to the locks and bolts but the only things taken were keys and - would you believe it - a notice warning of church break-ins. As they discovered there is little of worldly value in the church - but the repairs will cost far more than anything they could have taken. The Methodist Church was also targeted. Let us remain vigilant and do our best to stop it happening again. Rolleston’s best-selling author, Stephen Asbury, is set to publish his second book after securing a contract with the Institution of Occupational Safety and Health (IOSH). After his first book - “Health, Safety, Environment and Quality Audits – A Risk-Based Approach” – was published in 2007, it went on to be a best-seller in its sector in the UK, as well as in Canada, Australia and South Africa. It is still selling very well. Stephen’s second book is called “Corporate Social Responsibility”; which concerns the approach of organisations towards protecting the planet, human rights and ethical trading – it is the ‘how to do it’ guide on sustainable, ethical practice. The new book was written over the last twelve months, while Stephen was touring the World speaking about his first book – he has spoken in universities and technical centres in the USA and Canada, Spain, Malaysia, and Trinidad. The new book will be published in March 2009 at the prestigious IOSH 2009 conference at the BT Convention Centre in Liverpool. In first place, with 97 points - the Bush Family!! Runners up on 96 points - Chris Brandon, R. Ives, G. Woolliscroft and Mrs L. Beer. Closely followed by Dr M. Staley, Mrs R. Alsop, Mr & Mrs C.Wedd and D. Betteridge on 95 points. Rolleston Almshouse Charity Trustees would like to acknowledge two grants obtained by our local councillors from their community funds. A grant from ESBC Cllr. John Morris has allowed them to remove the poor quality “rubble” that has formed the soil of the flower beds above the brook. This has been replaced by Phil Gould with good quality top soil which will greatly improve planting and avoid the problem of broken glass etc. Grants from ESBC Cllr John Morris and SCC Cllr. Bob Fraser have brought the Almshouses into the digital age. They have been able to replace the TV aerials that spoiled the sky line with one digital aerial which can serve all properties. The Trustees have begun an investigation into refurbishment of the Almshouses and upgrading the amenities. They have appointed a Derby firm of architects who specialise in the modernisation of listed buildings, liaison with planners, English Heritage, etc. to advise on the way forward. Nothing will happen to affect the appearance and setting of the properties from Burnside. 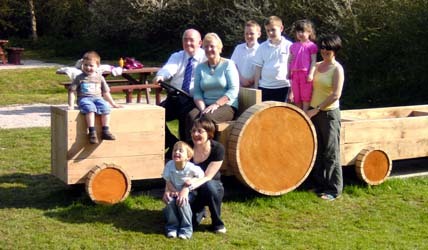 It may be several years before funds for any works can be obtained but they have started “getting the ducks in a row”.